Reload your betting account with up to €200 extra! 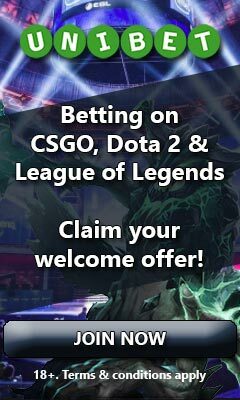 In addition to the one of a kind and exclusive welcome offer that all visitors of eBetFinder are able to receive when making their first deposit at Arcanebet, an exclusive reload bonus is now also possible to get your hands on when betting on eSports or any other sports event. By using the above mentioned Arcanebet bonus code while making a deposit, your deposited amount will be matched by an equal bonus amount added to your account, up to a total of €200. To make the most of the offer, a deposit of €200 would earn you €200 extra to bet with. The bonus can be used at any time you like, but can only be activated once. Before being able to make a withdrawal, the received bonus amount needs to be turned over 18 times on odds 1.60 or higher for each selection chosen in your betting slip. This has to be done within 360 days, which means that you got plenty of time to complete the wagering. Although the bonus isn’t nearly as enticing as the world class welcome offer that has a lower wagering requirement and no minimum odds to it, the offer can still be used as a good bankroll booster as long as you choose your bets carefully. Something that shouldn’t be a problem since you have an entire year to fulfill the conditions of it!